August 3, 2016 July 5, 2011 by Vinay Leo R.
I woke up as the rooster announced morning’s arrival. In silence, I saw the sun rise, majestic above the hills and with the breeze serenading the fields as I, with a hoe, harvested the wheat of my labor. I smiled; content. The day would be beautiful. Then I awoke, to the hullabaloo of the city. 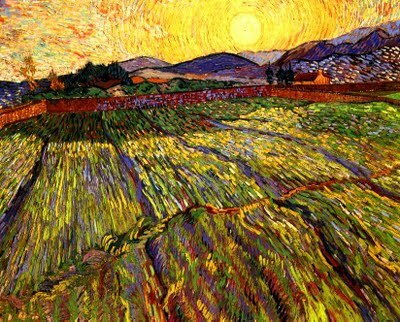 I share this post with Flash 55 Friday, and with Magpie Tales where Tess Kincaid has given this beautiful image of the Vincent van Gogh painting, Wheat Field with Rising Sun, to inspire us. I enjoyed reading this one… such a lovely, serene dream…too bad our realities didn’t always match! Thanks so much, Ginny. Yes, I know. If only.. but that life ain’t meant for everyone I guess. Oh, how pesky reality can scupper those dreams! Neat little write and heart felt, too! Yes. Sudden riddance to that dream.. Thanks, Helena. I wrote from the heart, glad it reflected. Hope and beauty – the world heralds that in that instant. Just that one moment… Thank you Clariice. This reads like a free verse poem. You might want to play with your lines, breaking it up into a free verse poem, and see what happens. I love the idea of the breeze serenading the fields. That’s a great image. It started out as a free verse; sort of. Then, the play with the last line struck me. So decided to go that way. Glad you loved the post, and that line in particular. Thanks, Sioux. Yes.. I dream of a simpler life too, mindlovemisery. 🙂 more so for the food 😉 Thank you. Glad you liked it, Tess.. Yes. It bites big time, Helen. Yes, but I do wonder what Mr. van Gogh would have written about it if he were here still. 🙂 Thanks for liking my work, Dani.